Simple Sleeper Play Tunnel is a tunnel of fun for a great price. Ready to hang in any cage to provide hours of fun or cozy relaxation. Durable fabric tunnel has nylon straps with metal swivel clips for easy and secure hanging. Assorted colors. 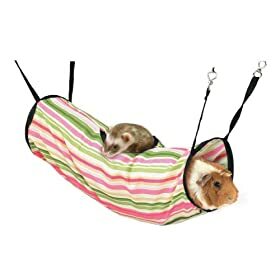 Wonderful item for pet rats as well!